Several production strategies can be used to grow herbaceous perennials. The simplest method involves purchasing plugs and/or small cold-treated plants and potting them up in late winter or early spring for late spring sales. While the cost to the producer for plants is high, the expenses associated with overwintering, heat, watering, and pesticides is lessened. In addition, there is little risk of plant loss. Another strategy involves planting one year old plants in 1 to 3 gallon containers in September or early October. These plants establish their root systems in the fall, and then are overwintered in protective structures for early spring sales. The plants usually cost less than the spring planting method, but costs of overwintering and plant losses are incurred. The advantage here is that the producer may have more time in the fall than in the spring. Some growers like to control their source of plants and produce perennials from propagation to finishing. This requires skill in growing as well as overwintering. Because plants are purchased when small, costs are controlled to greater extent by the finished plant producer. If the method you choose involves overwintering container perennials, then the following information may be helpful to you. Unlike field grown plants, container-grown plants cannot take advantage of the temperature buffering effect of the soil. Roots are much less cold-hardy than the shoots. Since most roots of plants growing in containers tend to spiral around the inside wall of the container, the only insulation these roots have is the thin wall of plastic. Research in Oklahoma has shown that the temperature of the root ball in an unprotected container can approach that of the ambient air. These colder root zone temperatures increase the probability of cold injury to roots of plants otherwise considered hardy when grown in the field. Therefore, winter protection of container plants is essential to their survival. The key to overwintering is to maintain even temperature, keeping the plants cold and alive but not actively growing. When plants are allowed to freeze and then thaw, there is a greater risk for plant loss. The degree of winter protection should be based on the expected minimum temperatures at a particular site and the root hardiness (the lowest temperature at which roots survive) of species being grown. Root and crown hardiness have only begun to be identified for herbaceous perennials by researchers. Until root hardiness is identified, growers have no choice but to take steps to avoid losses of plants. See Table 1 for a list of perennials and root media temperatures. 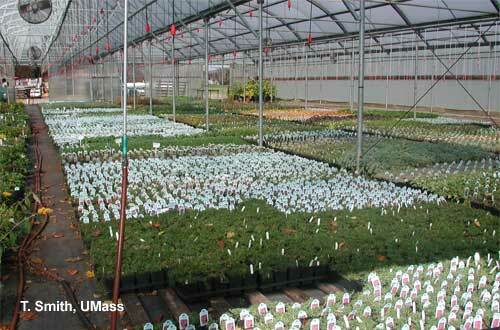 Massachusetts has six hardiness zones representing a wide range of temperatures. As a result, growers here use many different methods for covering or overwintering herbaceous perennials in containers. Some experimentation will be necessary to determine which method of overwintering works best for your situation. Successful overwintering begins when plants are potted. Perennials should be potted up and allowed to establish themselves for several weeks prior to overwintering. Most potting takes place by early October to establish the plants by early November. The better the root system, the better the chance the plant will survive the winter. With the onset of cold weather, top growth dies back on many perennials while others, such as Iberis sempervirens and Dianthus have above ground plant parts which overwinter. Dying plant debris should be removed prior to overwintering to prevent botrytis infection. The next step is to water everything well, but let the foliage dry prior to covering. Watering is important because water is being used as a source of heat. Liquid water has a temperature above 32º F and when it freezes it gives off heat. Therefore, we are using water as a source of heat because we know that dry soil freezes much more quickly than wet soil. Avoid overwatering plants during the winter. If you keep the plants too wet, diseases such as root rots will become a problem. In an unheated polyhouse watering may be needed as often as once every two weeks, while ground beds covered with thermal blankets usually do not need watering. Regardless of the method of overwintering, if possible, soil moisture should be checked periodically. Soil temperatures should be in a range of 30 to 34º F for most perennials. Temperatures cooler than 30º F may kill some sensitive species. Use a soil thermometer to verify that plants are in this range. Fluctuations always occur during the winter. If the temperatures warm up for several days above 40º F then ventilation should be provided. The final step prior to covering plants is to provide some type of rodent control. Many growers use commercially available baits while others have reported that human hair or cut up deodorant soap works for them. Fact sheet on rodent control. There are two basic methods for overwintering perennials, maintaining plants below freezing or above freezing. Various techniques that can be used to overwinter perennials are listed below. One of the simplest techniques growers have been using to keep plants at a constant temperature below freezing is placing a sheet of insulating material over containerized plants during the coldest months of winter. Commonly used thermo blanket materials include Microfoam (¼" flexible, polypropylene foam), The Winter Blanket (polyethylene foam, laminated with 3-mil UV resistant P/E) and Guilbond (1/4" closed cell polyethylene foam laminated to white UV treated polyethylene film).There are also fleece materials available that work. Containerized herbaceous perennials that are ready for storage can be placed pot to pot in an upright position on the ground in the production yard and simply covered with a material having insulating qualities. Tall plants can be leaned over just like laying shingles, exposing as much foliage as possible to light. Coverings are usually secured by tucking the edges underneath the containers or by weighing down the edges with heavy objects such as crushed stone or rocks. The thermal blanket sheets should be oriented in a north-south direction. With some thermal blankets, sheets of 4 mil white polyethylene plastic are placed over the blanket; other types do not need this extra layer of plastic. Follow the manufacturer's recommendation. At the end of the winter season, store thermal blankets in a dark area so they will last two or more years. In locations where air temperatures are likely to fall to -10F, or where land is exposed to high winds, consider using a double foam layer or placing plants inside an unheated greenhouse under foam or in a minimally-heated greenhouse (see below). Thermal blanket systems are relatively inexpensive as compared to other methods of winter protection. They also trap and contain moisture sufficiently to eliminate the need for supplemental irrigation during the winter. However, problems under the blankets are difficult to detect because the blankets are opaque. Also, containers stored under thermal blanket systems tend to warm prematurely during winter thaws or near the end of the storage period. Warming may result in shoot growth that can be injured by the return of freezing temperatures. Therefore, venting may be advisable during unexpected periods of warm winter weather. Finally, thermal blankets are usually so tight in respect to air exchange that ventilation is practically non-existent. In areas where 3 to 4 months of cover are required, growers must be concerned with the development of molds and decay. Some growers successfully use layers of plastic and straw to maintain temperatures below freezing. A framing system of either inexpensive lumber or wire is built over the beds in which the container plants have been placed. One layer of inexpensive clear plastic is draped over the structure to completely cover the plants. A 4 to 6 inch layer of straw is then placed over the first sheet of plastic which, in turn, is covered by a second sheet of white plastic. The advantage of this type of system is that it provides the greatest degree of thermal protection of any of the unheated systems. Since the insulative barrier is suspended up above the plants, an air space is provided above the plants, which minimizes the development of molds. Plants are so well insulated that warming of plants at the end of the winter is delayed. One disadvantage of this system is that growers cannot see inside; another is that a great deal of labor is involved in the set-up and take-down, making it more expensive. Growers would best use this system for their most cold-sensitive species. Another common way growers overwinter plants below freezing is by using unheated quonset polyhouses. These structures are usually constructed with wooden frames to which uniformly bent galvanized pipe are attached. The pipe provides the basic structure that supports one or two (air-inflated) layers of polyethylene that are secured to the wooden baseboards to which the bows are also secured. Under average conditions, temperatures within these structures do not reach levels that result in injury to plants that are stored inside. However, during extended periods of extreme cold (more than two consecutive nights when ambient temperatures go below 0º F), plant injury may occur. Once temperatures consistently drop to 25-30°F, pots can be covered with a thermal blanket, protecting plants from extreme cold. This technique can create a microclimate in the immediate vicinity of the plants that is 8 to 10 º F warmer than air above the blanket inside of the structure. Currently, it is recommended that the thermal blanket be placed over the plants only for the duration of the extremely low temperatures so as to avoid excessive moisture buildup in the container environment. During periods of prolonged warm weather, monitor the temperature of the pots closely. If the pot temperature consistently stays above 40°F, then remove the thermal blanket. Placing a layer of bagged leaves around the outside of the overwintering house will add an extra amount of insulation to the root area. Some growers use furnaces in their polyhouses for those extremely cold periods. The process of taking the cover off the structure in spring is critical if plant injury is to be avoided. Gradual removal of the cover in February and March is suggested. First doors and windows are opened, then small vents are cut into the ridge of the cover. Later the vents are enlarged, and finally the cover is removed in late March to April. Plants, especially those with foliage on them, must be checked frequently for outbreaks of botrytis and sprayed with a fungicide as needed. Phlox subulata and Myosotis spp. are especially vulnerable to rotting. The best structures are those that are large enough to easily check and treat plants. Quonset style polyethylene structures are a rather expensive alternative if one considers only the initial construction costs. However, well-constructed frames and bows will last ten or more years before any major renovations are needed. In addition, thousands of plants can be covered with plastic in a matter of hours. For large operations, this offers considerable efficiency as compared to other methods of overwintering. Finally, these structures allow the grower to inspect plants and to remedy any problems that may be noted. Plants which are considered marginally hardy when grown in containers should get additional protection with thermal blankets or a heater inside the structure. An entirely different technique such as the plastic-straw-plastic cover is described later in this article. For structures with two layers of covering, growers use white polyethylene for the outer layer and clear or white for the inner layer. This will help control the amount of light and heat in the structure. Even so, plants in houses covered with white plastic can begin to grow too early during periods of unusually warm weather. To avoid premature budbreak, orient the polyhouse in a north-south direction. North-south oriented polyhouses tend to be cooler than east-west oriented structures. If more than one type of plant is to be overwintered in the same structure, place the most cold-hardy types near the walls. This is the coldest part of the polyhouse. Plants should be spaced pot to pot for the best insulation. Polyhuts are similar to polyhouses except they are usually only about 30 inches high and 4 to 6 feet wide. As with polyhouses, the plants should be spaced as close together as possible. Sometimes, the containers are stacked in two or more layers for space conservation as well as protection from cold temperatures. Unlike polyhouses, it is usually not feasible to water plants in polyhuts at frequent intervals, so the plants must be well watered before laying the covering over the structure. As with polyhouses, place baits throughout the polyhut for protection against damage by rodents which would feed on the plants during the winter. Once the foliage is dry after applying water, cover the polyhut with white polyethylene plastic. In the late winter or early spring when the days are sunny, you will need to provide ventilation for the plants and reduce the humidity under the plastic covering. With polyhouses, the end walls are often opened or rolled back to let cool air into the structure. If the structure has a door at each end, these may be used for ventilation. However, place a sheet of plywood over the lower half of the doorway. This will prevent cold, drying air currents from moving through the structure at plant height. A two-piece door which allows the top half to be opened while the bottom half remains closed is another way to minimize movement of cold, drying air through the plants. As the days begin to warm up, many growers provide ventilation to polyhouses and polyhuts by making three cuts in the plastic at about right angles to each other. Then the plastic flap is rolled back and secured with duct tape. If a drop in temperature is expected, the flap can be unrolled and sealed with duct tape. Many growers feel it is easier to keep plants thawed than frozen due to the variability of the weather. For example, it is going to be very difficult to keep plants from thawing during a January thaw at temperatures of 40-50°F. Heated greenhouses with roll-up sides are an option for overwintering plants above freezing, and is successfully being used by many growers. This method requires minimal fuel and results in very few plant losses. To use this method, perennial houses are heated to 50°F until all of the plants are well rooted, then the temperature is slowly decreased to 35°F so the plants will vernalize and flower in the spring. The roll-up sides are especially useful in the spring when warm sunny days rapidly raise the greenhouse temperature and push the plants along too quickly. Roll-up sides allows the plants to be kept at the same temperature inside as it is outside, whether it be during a winter thaw or in the spring. Rolling up the sides is also useful for hardening off plants in the spring while being able to easily drop them for protection if unexpected cold weather or snow arrives. Roll-up sides can easily be installed on hoop or gutter connected houses at a minimal cost. A variety of other techniques have been utilized to protect containerized herbaceous perennials during winter, including covered cold frames, earthen pits, sunken frames, root cellars, barns and sheds, evergreen boughs and deep snow. Any measure that protects the plants adequately and is reasonable in an economic sense merits attention. 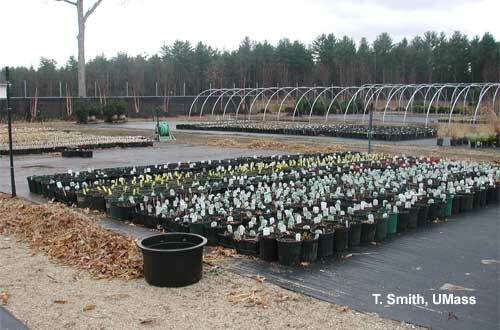 Most containerized perennials are covered as late in the season as weather permits. It is not uncommon to see plants being covered in late November or early December. Waiting as long as possible to cover plants will allow plants to harden off that will minimize the risk of winter injury during winter storage. Just as it is impossible to determine the best possible date for covering perennials across the state, it is also impossible to identify an exact date for uncovering them, because of varying weather conditions each year. The goal is to obtain a compromise between preventing premature shoot growth and ensuring that unusually cold weather that can occur in late winter and early spring does not kill or injure plants. Protected plants must be inspected frequently to ensure that shoot growth is not initiated. If any signs of such activity are evident, the storage environment should be vented to introduce cool air into the system to slow plant development. Many growers will cut large holes in the sides of poly structures to facilitate ventilation. The remaining poly is left in place to provide some protection if necessary. Those using thermal blankets will roll back the covers but will keep them handy in case the weather becomes much colder and plants need to be recovered. Source: Perry, L. 1998. Herbaceous Perennials Production. Northeast Regional Agricultural Engineering Service. pp 56. Drew, D. 2002. Overwintering Perennials Outside. Ohio Florists' Association Bulletin, No 873. Drumgool, C. 1997. Overwintering Perennials in the Greenhouse. The Mayflower, Massachusetts Flower Growers' Association, No. 2, 1997. Good, G.L. 1986. Implications of cold hardiness in the production and use of herbaceous perennials. Proc. 1986 Perennial Plant Symposium, Columbus , Ohio . Gouin, F. 1983. Utilizing thermo-blankets in overwintering. Proc. 1983 Herbaceous Perennial Symposium, Columbus , Ohio . 1987 Cornell Guidelines for Production of Herbaceous Perennials for New York State . Nau, J. 1987. A perennial primer. GrowerTalks. October issue. Pealer, G. 2002. Overwintering Container-Grown Perennials Using "Minimum Heat" Polyhut Structures. Ohio Florists' Association Bulletin, No 874. Perry, L. 1998. Herbaceous Perennials Production. Northeast Regional Agricultural Engineering Service. pp 55-61. Pilon, P. 2016 Ravaging Rodents. Perennial Pulse, Ball Publishing. Jan 26 issue. Pyle, A. 2011. Perfecting Perennial Production. Greenhouse Management Magazine. August Issue. Snyder, J. 2002. Overwintering Container-Grown Perennials Using Retractable Roof Greenhouse Structures. Ohio Florists' Association Bulletin, No 875.